Though this middle-grade fantasy chapter book shares the same world as Jaclyn Moriarty’s earlier book, The Extremely Inconvenient Adventures of Bronte Mettlestone, this is not really a sequel. While Bronte does make a few appearances as a secondary character, this is a new adventure with new protagonists, and it works perfectly well as a standalone title. 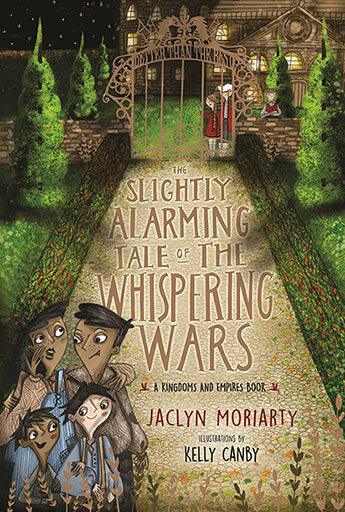 It’s written in an epistolary style by Finlay and Honey Bee—two children who play an important part in the magical conflict referred to as the Whisper Wars—and it feels as though they are writing down their adventures as they happen. Time travel, lost parents and making sure the future turns out right all add to the sense of immediacy. This book contains the usual tropes of traditional fairytales: orphans and rich kids, spoilt brats and kind hearts, overlooked people with hidden depths, sirens, witches, dragons and, of course, lots of magic. The real joy of this book though is the sincerity of Honey Bee and Finlay, from their inside jokes and teasing of each other’s writing, to sharing their deepest secrets and fears with each other. They also talk directly to the reader, including them in the narrative in a way that will make them want to read until the last page. Released in hardback and illustrated by Kelly Canby, this is terrific book for readers aged 10 and up who aren’t quite ready for the likes of J K Rowling and Jessica Townsend just yet.